Apricot and Coconut Squares. I did not plan on making this. I wanted to make something else which I had planned to bake for the last couple of days. Took out my flour, sugar, etc.. and, my recipe book, "Brownies and Bars", which happens to be my favourite, at the moment. But somehow, I found myself turned to another page, and that's it, I'm making this now! So another unexpected recipe came to see the light of day, and the other one being shoved away until later! Has this happened to you before? Well, this is not the first time for me! This is a sweet delightful treat. The addition of desiccated coconut gives it a soft chewy texture. Of course there is the delicious tanginess from the apricots and the walnuts gave an added slight crunch. As usual, the sugar is reduced, which turned out perfect. I'm linking this recipe to Recipe Swap Thursday #5 at Prairie Story. Check out other yummies at Prairie Story and link yours too! Preheat the oven to 180 degrees C/350 degrees F/gas mark 4. To make the base, sift the flour into a bowl and add the coconut and caster sugar. Stir in the melted butter and spoon the mixture into the prepared tin. To make the topping, mix the apricots, sugar, coconut and walnuts together in a large bowl and stir in the eggs. Spread over the base and then bake for 20-25 minutes, until golden and springy. Leave to cool. Drizzle the cold cake with the melted chocolate to decorate and then cut into squares or bars. Store them in an airtight container. Ever seen this flower? Can you name the plant of this flower? 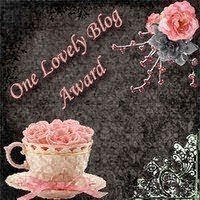 Rebecka of "At Home With Rebecka" has graciously extended "One Lovely Blog Award" to me of which I have accepted with honour. Thank you, Rebecka! It is nice to know you even when we are thousands of miles away! Each and every one of them are lovely in their own special way. Please do visit them to see their lovely blog and make a new friend along the way, after all, without our blogger friends constant encouraging words and support, we might as well give up blogging! Special announcement : Please join in, the more the merrier! There is a "Culinary Smackdown Battle Chile October 2010" at "At Home With Rebecka". Go on, get some hot stuff smoking and head on down to Rebecka's. Please do drop by her wonderful blog for more info. Have fun! It has been awhile since I last baked a bread. And this bread turns out a little "too-green"! The texture is really soft. When I cut the first slice, I can feel the softness of the bread, but when I saw the colour, OMG! why is it so green! The same reaction with my hubby, when I gave him a slice! The kids think that the green is really nice! Besides that, the bread turns out really well. This is a recipe from Alex Goh's, "Magic Bread". His instructions are all very brief, which might be confusing for someone who is totally new at baking and I notice that most of the baking pan recommended are not suitable. For this bread, he states that the size of 17x9x7cm pan should be used and this will yield 4 loaves of bread! Looking at the amount of the dough, I am not confident that this will make 4 loaves of bread, even though the pans recommended are small, besides, I do not have such size pans. I decided to make this into two loaves by using 21x11x6cm pans, and I'm glad I did. Take note that the gelatinized dough needs to be prepared a day earlier. This is fairly easy and simple. This bread is great spread with butter, it still stays soft the next 2 days. Does it stay soft on the fourth day? No idea, we finished it all on the third day. Really good with a cup of hot coffee. Add the boiling water from A into flour, mix until well-blended to form dough. Cover and set aside to cool. Keep refrigerated for at least 12 hours. Mix B until well-blended. Add in C and knead to form rough dough. Add in A and knead until well-blended. Add in D and knead to form elastic dough. Take 400gm of the dough and mix with E until well-blended. Add in F and mix until well-combined. The rest of the dough remains plain. Let it proof for 40 minutes. Divide the plain and green dough into 4 portions each and mould it round. Let it rest for 10 minutes, then roll it flat. Place a piece of flatten green dough on top of plain dough, roll it up like Swiss roll. Place it into a greased 17x9x7cm loaf tin. Make 4 loafs. Let it proof for 50 minutes. Bake at 180C for 30 minutes. There will be a "Culinary Smackdown Battle Chile October 2010" at "At Home With Rebecka". Go on, get some hot stuff smoking and head on down to Rebecka's. Please do drop by her wonderful blog for more info. Have fun! When I think of century eggs or hard-boiled eggs, pickled ginger would come to mind. When I think of pickled ginger, century eggs or hard-boiled eggs would come to mind. Am I making any sense? I do? Great! Yup, you got it right! They are made for each other! Ever tried pickled ginger before? Pickled ginger is made by using the young ginger, the old ginger are too fibrous and extremely hot, sometimes even bitter. The young ginger are sliced very thinly, marinate with some salt and then soaked in the vinegar and sugar solution. This is usually left for at least 5 days in the refrigerator for the flavours to develop. There will be a light delicious crunch. Pickled ginger can be eaten as it is, as garnishing, in stir-fries and very delicious served with roasted meat. Try it in sandwiches, burgers or chop it to smaller pieces and mix into salads. Sliced young ginger marinated with salt. It will naturally turn to a nice light pinkish shade due to the reaction of the hot vinegar and the young ginger. Yummy, fresh from the fridge, cool, crunchy with a tinge of sourness from the vinegar, sweetness from the sugar and a little heat from the ginger! It's time to serve with some hard-boiled eggs and century eggs. I do not think that the hard-boiled eggs need any introduction! As for the century eggs, this is interesting! Have you eaten century eggs before, seen or smell it? Century eggs are usually made from duck eggs, sometimes chicken eggs or quail eggs. Century eggs are also known as preserved egg, hundred-year egg, thousand-year egg and millennium egg. Wow, it does sounds old, doesn't it? It is a Chinese cuisine and is preserved in a mixture of clay, ash, salt, lime and rice hulls. This may take from several weeks to several months depends on the method of preservation. I know what you must be thinking! Yulks! I thought so too when I was small, but I have learn to appreciate and love it as I get older! It is really an acquired taste. The yolks are dark greenish-brown creamy-like texture with a strong odour of sulphur and ammonia. I used to cover my nose when my mum ate this when I was a little girl! The whites will be dark-brown, jelly-like texture and has very little flavour. It can be eaten as it is, usually it is served in quarters, with a few slices of pickled ginger on each slice. It can also be used in cooking Chinese congee, stir-fries and as an additional ingredients in some soups. My daughter seems to like this. My son has a rather interesting description when he ate this, he says "the white is like tasteless jelly, while the yolk is like putting an oyster in the mouth, creamy and soft"! This is how the eggs look like, willing to try, anyone?? Wash ginger and scrape skin off. Slice the ginger into very thin slices. You may want to wear a pair of kitchen gloves as the ginger can get very hot. Put the slices in a bowl and mixed with 2 tablespoons of salt evenly and keep covered for about 1 hour, stir once after half an hour. Wash the salted ginger with cooled boiled water and drain in a colander. Put the ginger slices in sterilized jars. Meanwhile, boil the vinegar together with the sugar until sugar melts and mixture starts to boil. Pour the hot mixture into the jars over the ginger slices. Cover loosely and when cool, close tightly and store in the refrigerator. You may notice that the ginger has turned to a nice pink. Let pickle stand for at least 5 days for the flavour to develop. Can keep for months if stored in refrigerator. "Would YOU dare to try the century egg, maybe just a slice?" When it comes to chicken, I'm a wing person! The same goes for my daughter. My son loves the drumstick. My hubby, anything goes! For dinner a couple of nights ago, I cooked this delicious fried chicken wings, coated with the pepper jelly (recipe with courtesy from scrambledhenfruit) which I made two weeks ago. It was delicious! Without doubt, there will be a repetition of this very soon! I'm linking this to Recipe Swap Thursday at Prairie Story, be sure to visit Prairie Story for other delicious goodies! Marinate the chicken wings with garlic salt for about 15-20 minutes. Just before frying, add the cornflour and stir till evenly coated. Heat oil for deep frying. When hot, deep-fry chicken wings till crispy and brown on both sides. Dish out to paper towel to absorb excess oil. Mix everything together in a bowl. Adjust seasonings to taste. In a medium saucepan over medium heat, heat sauce and when it starts to bubble, add the fried chicken wings and stir till the wings are coated with sauce. Dish out and serve immediately. Enjoy! Delicious, moist, buttery cake. Just as I like it! I love buttery cakes. The canned apricots are a little sourish with the tangy taste of the fruit and this really pairs well with the cake which is not too sweet (after I reduced the sugar). I think this would be lovely with fresh apricots! This is a really tasty and delicious cake to share with family and friends. please click to see more delicious treats at Potluck Sunday and Cookbook Sundays. Preheat the oven to 180C/350F/Gas Mark 4. Oil a 20.5cm/8 inch square cake tin and line with non-stick baking paper. Sprinkle the sugar and the flaked almonds over the paper, then arrange the apricot halves cut-side down on top. Gradually beat the eggs into the butter mixture, adding a spoonful of flour after each addition of egg. When all the eggs have been added, stir in the remaining flour and ground almonds and mix thoroughly. Add the almond essence and the apricots and stir well. Spoon the mixture into the prepared tin, taking care not to dislodge the apricot halves. Bake in the preheated oven for 1 hour, or until golden and firm to the touch. Remove from the oven and allow to cool slightly for 15-20 minutes. Turn out carefully, discard the lining paper and transfer to a serving dish. Pour the honey over the top of the cake, sprinkle on the toasted almonds and serve. One of my favourite chicken dish! There are many versions of chicken kurma. It can be cooked fairly dry or with gravy. For a thicker gravy, usually about 1 tablespoon of ground almonds or cashewnuts is added during the last few minutes of cooking. Mixed kurma powder can be easily purchased from any grocery or supermaket for those who do not stock up on individual spices in their kitchen. My mum used to cook this in a big pot and we would have this with rice for lunch and dinner! It even tastes better the next day, as most curries do. Have not cooked this for quite a while, this is a mild curry dish that children will love. It is really nice, eaten with our local nasi minyak or nasi briyani with a cucumber salad on the side. I ate this with some plain white rice and sambal belacan. Yummy! 1. Heat oil and fry onions till soft. Add in cinnamon stick, cloves, cardamom pods and saute until aromatic. 2. Add blended ingredients and fry for about 2-3 minutes. Add in mixed paste and fry until fragrant and oil separates. 3. Add in chicken pieces and stir until well coated with the spices. Pour in the coconut milk and cover. 4. Let it boil for about 2 minutes and add in potatoes, tomatoes and green chillies. Add salt to taste. 5. Cover and simmer until chicken and the potatoes are cooked. 6. Dish out and sprinkle some crispy fried shallots. Enjoy! A tasty, delicious snack that everyone will love. Simple and easy. Potatoes! Everyone's favourite, at least in my house. Good in everything, curries, stews, breads, patties, just plain-old fries, in fact just about everything! There are so many different variety of potatoes and some of them can be very expensive. For this recipe, I use the US potatoes, as I love their floury texture which is excellent for mashing and roasting. This is simply great for breakfast or an after school snack. Even my nine year old niece who doesn't like vegetables, ate a few of these without complaining, and I use chives, spring onions and cilantro! Try this one out and you will be making it again! Cook the potatoes in a large saucepan of lightly salted boiling water for about 20 minutes, or until tender. Drain. Place the potatoes in a bowl and mash with the butter. Add salt and pepper, to taste, and stir in the chives and parsley. Beat in the flour. Add a little milk if the mixture is too dry. Form the potato mixture into a ball and divide into 8 rounds. Roll each one out on a lightly floured surface to a thickness of about 5mm (1/4 inch). Prick surface all over with a fork. Lightly oil a heavy-based frying pan. Heat the pan, then cook the potato scones, a few at a time, for 3 minutes on each side, until golden brown. Another delicious recipe from Liz Franklin's, "brownies and bars". I really like this book! The few recipes that I have tried, have turned out really well. I love cranberries and almonds, and this recipe is just perfect. As usual, I reduced the sugar and sweetness turns out just right. This cake has a lovely soft texture with a light buttery moist. I will be making this again, for sure! Preheat the oven to 180C/350F/gas mark 4. Cream the butter and sugar together until light and fluffy and then add the eggs, a little at a time until they are all fully incorporated. Stir in the flour, followed by the cranberries and apples. Add half the almonds and then spoon the mixture into the prepared tin. Scatter over the remaining almonds and bake for 30 minutes, or until golden and springy. Leave to cool in the tin, sprinkle with a little caster sugar and cut into squares. Store in an airtight container. Dragon fruit is low in calories, and contains numerous nutrients, vitamin C, phosphorus, calcium, plus fiber and antioxidants. This plant is actually a type of cactus! They are also known as Pitahaya or Strawberry Pear. The flesh of this fruit comes with 2 types of colours, white and red. As you can see, the one I bought is red, I think that it is sweeter than the white variety. Get the really ripe ones for a sweet fruit. The way to eat it is by cutting it in half crosswise and just use a spoon to dig in, just like kiwifruit. Another method will be to peel off the skin and then slice the juicy flesh. This fruit weighs 800gm! I only use half the fruit to make about 1.5 litre of ice-cream. Have you seen or eaten this fruit before? It makes very good ice-cream! This ice-cream is really creamy and it doesn't take very long to churn. Mine took only about 15-20 minutes for it to turn thick and creamy! The great thing is you don't need to take it out of the freezer to soften it before eating, just take it out and dig in! It is so easy to scoop! Put first 4 ingredients in a saucepan, stir and bring to boil at low heat until slightly thick. You may adjust sugar or lemon juice to taste. Remove from heat and leave to cool in the refrigerator for at least 6 hours or overnight. Stir in whipping cream and use a hand whisk or a fork to evenly combine. Churn it into your ice cream maker and freeze overnight. Enjoy! scrambled hen fruit, this post is for you! I came across this fabulous pepper jelly recipe from one of my favourite blogs, scrambled hen fruit. What really caught my attention to this recipe is the usage of hot chili peppers and dried apricots! I love chili and apricot, and this seems to be the perfect combination! Now one of the ingredients needed for making this jelly is liquid pectin. I have been looking for this liquid pectin for more than a year, yes, I have a lot of KIV recipes for preserves and such, and this is one of the base ingredients needed. The store which I usually go to for my bakery needs, happens to bring in powdered pectin as one of their new product. I was estactic and bought a bottle. The problem is, ALL the recipes that I came across either use liquid pectin or preserving sugar (sugar with pectin added). Now I found out from the web that 2 tbsp of liquid pectin equals to 4 tsp of powdered pectin. And, scrambled hen fruit informed me that a packet of liquid pectin is equivalent to 90 ml. By conversion, I should use about 12 tsp of powdered pectin. The original recipe from scrambledhenfruit is actually called "Habanero Gold Jelly". Again, I could not find the habanero peppers over here! So I use the jalapeno peppers and our local, extremely hot bird-eye chili. I was tempted to use more of the bird-eye chili, but too much of it, will be too hot for my kids, so I only use about 5 of these. I then set out to make this long-awaited jelly. Apparently, by using 12 tsp of the powdered pectin is not enough, the jelly doesn't set after leaving it overnight. The next morning, I heat it up again and add in another 4 to 5 tsp more. It sets up beautifully after that, but I guess I added a little bit too much of the pectin and it sets slightly harder than I like it to. But no problem, when I want to use it, I just mix a little bit of hot water, microwave on high for about a minute and mix until I get the consistency I want. I think that in total 14-15 tsp of powdered pectin will be just right. It will set further upon refrigeration. This pepper jelly turned out fabulous. I reduced the sugar to 2-1/2 cups and add another 2 tbsps of the vinegar, because I like it slightly more sour. This jelly is great as a dipping sauce. I deep-fried some squid for our dinner with this pepper jelly as the dipping sauce. The reaction from the family, they love it! My daughter asked me "where did you learn to make this nice sauce?" So for the full recipe and instructions on this fantastic "Habanero Gold Jelly", please stop by "scrambledhenfruit" and also, look out for her beautiful seedless blackberry jam! (My eyes just 'pop-out' when I saw this!) I wish I could make this, but imported blackberry are definitely not easy to find, and it will definitely cost a bomb! Thank you scrambledhenfruit, for sharing this fabulous jelly recipe! My next 'project' is to make my own liquid pectin using apples and lemons, since I can't seem to find any over here! Clean squid, cut to rounds. Blanch in boiling water for 10 seconds. Drain and pat dry. In a bowl, combine all batter ingredients except the cooking oil, and mix to a thick batter. Gradually stir in the cooking oil and stir till well combined. Heat oil for deep-frying. Dip pieces of squid in batter till well coated. Fry in hot oil about 1 minute on both sides until golden brown and crispy. Drain on paper towels to absorb excess oil. Serve while hot and crispy with your favourite dipping sauce. Mix pepper jelly with hot water and microwave on high for 1 minute. Remove and stir to combine, extra hot water may be added if you like a thinner consistency, add some salt to taste and stir till evenly mixed. Serve immediately. This is a simple, lazy afternoon weekend tea-time snack. The family woke up later than usual, and by the time we had breakfast, it was already in the afternoon. So nobody wants any lunch. Look for something to make as a tea-time snack, and found this simple to do flatbread. It is indeed a garden herb flatbread. All the herbs can be found in my garden, except for the oregano! Open up a can of Campbell's mushroom soup (I always keep one for lazy times like this! ), and there we go, the kids happily enjoy their snack! There's even a request again for 'next time'! Divide the dough in half. On a lightly floured surface, roll each portion into a 12-inch circle. Transfer to the prepared baking sheets. Brush the dough with the 2 tablespoons olive oil. Using a fork, prick the entire surface of each circle several times. Sprinkle with 2 teaspoons fresh or 1/2 teaspoon dried thymes. Do not let rise. Bake in a 400 degree F oven for 11 to 13 minutes or until crisp and golden brown. Remove from baking sheets, cool slightly on wire racks. Serve warm or cool.